Deformation and Fracture Mechanics of Engineering Materials provides a combined fracture mechanics-materials approach to the fracture of engineering solids with comprehensive treatment and detailed explanations and references, making it the perfect resource for senior and graduate engineering students, and practicing engineers alike. The 5th edition includes new end-of-chapter homework problems, examples, illustrations, and a new chapter on products liability and recall addressing the associated social consequences of product failure. The new edition continues to discuss actual failure case histories, and includes new discussion of the fracture behavior and fractography of ceramics, glasses, and composite materials, and a section on natural materials including bone and sea shells. 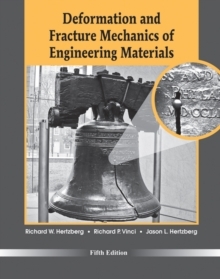 New co-authors Richard P. Vinci and Jason L. Hertzberg add their talent and expertise to broaden the book's perspective, while maintaining a balance between the continuum mechanics understanding of the failure of solids and the roles of the material's nano- and microstructure as they influence the mechanical properties of materials.